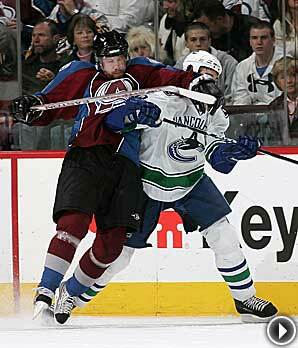 Peter Forsberg didn't shy away from physical contact in his first game back with the Colorado Avalanche. Peter Forsberg wasn’t concerned that he didn’t have a point in his first game back in the NHL since last April. He was just pleased that the Colorado Avalanche went home with another two points. Forsberg was greeted with standing ovations at the Pepsi Center when he took the ice in an Avalanche jersey for the first time since 2004. There were more ovations for the Avs after their 2-1 victory over the Vancouver Canucks, Colorado’s fourth straight win since signing Forsberg last Monday. His return after missing nearly five months while battling foot problems couldn’t have come at a better time for the Avs, who lost forwards Ryan Smyth and Marek Svatos to injury on Saturday. Forsberg didn't appear as though he'd been out of the game for almost a year. He had a nifty give-and-go with Joe Sakic that Roberto Luongo turned aside, displayed some nice moves on his troublesome right foot and even mixed it up a little bit with Alex Burrows. Defenseman John-Michael Liles broke a 1-1 tie with a power-play goal 2:27 into the final period. It was his first goal since Nov. 9 — also against the Canucks. The victory gives Colorado 76 points. The Avs and Nashville Predators share the last two playoff spots in the Western Conference, two points ahead of Vancouver, which is winless in its last four games. The Canucks were coming off a game in Chicago on Sunday in which they managed just 10 shots on goal. Sakic, who played on a line with Forsberg for most of the game, said his once and future teammate showed few effects from the long layoff. Avs coach Joel Quenneville had said he would try to break Forsberg in slowly. But with the game tight throughout, Forsberg wound up with 19:57 of ice time. He had three shots on goal, three takeaways and one hit. Sakic said the playoff race made it imperative that Forsberg get up to speed quickly. Paul Stastny put the Avs ahead 9:12 into the game, taking Wojtek Wolski’s pass in the left circle and firing a high wrist shot past Luongo. Ryan Shannon tied it at 18:58 of the second period, but Liles put Colorado ahead to stay with his third of the season. Jose Theodore made 26 saves for the Avs, including a stop on Markus Naslund’s blast from the slot in the final three seconds. With two big offensive cogs gone with injuries, Quenneville is glad to have Forsberg back. Craig Anderson won’t let the Panthers’ playoff hopes die. Two days after stopping all 53 shots he faced on Long Island, he was 40-for-40 in Boston before Nathan Horton’s goal 22 seconds into overtime won the game. It’s the most shots in consecutive shutouts in at least the last 20 years. Anderson has given up just one goal on 134 shots in his last three starts, including a 2-1 overtime win at Philadelphia on Feb. 23. Boston forward Glen Murray, who had the best scoring chance, felt the Bruins didn't take advantage of their limited chances. Alex Auld made 31 saves for the Bruins but was beaten by Horton's wrist shot inside the left post on the first shift of the extra period. The puck caromed off the leg of defenseman Mark Stuart. ''We block so many shots (as a team) it's bound to happen,'' Auld said. The Panthers won for just the second time in five games. Boston, coming off an embarrassing 10-2 loss at Washington on Monday, lost for just the third time in 10 games. The Panthers moved within five points of eighth-place Philadelphia in the Eastern Conference playoff race and play their next seven games at home, beginning Thursday night against Pittsburgh. Buffalo came to Philadelphia desperate for a win — and got one. Derek Roy and Jason Pominville scored 18 seconds apart early in the third period to break a 2-2 tie and bring the Sabres within a point of the eighth-place Flyers in the Eastern Conference. When Roy scored the go-ahead goal 1:06 into the third period, it seemed like he took advantage of a costly mental lapse by the Flyers’ defense. But Flyers coach John Stevens was furious after the game because Roy was the fifth skater during a 4-on-4. Replays showed the Sabres already had four players on the ice when Roy hopped over the boards and skated to the Flyers' blue line. Neither Stevens nor anyone on Philadelphia's bench caught the mistake immediately. ''I saw it after the fact,'' Stevens said. Pominville’s second goal of the game gave Buffalo a two-goal lead, and Maxim Afinogenov’s second goal of the night at 5:57 added some insurance. The Sabres have another tough challenge on Wednesday night, as they host the Washington Capitals. Scottie Upshall and Steve Downie scored for Philadelphia, which overcame an early 2-0 deficit but lost in regulation for the first time in five games. Philadelphia’s Martin Biron allowed five goals on 18 shots against his former teammates. He is 2-2-1 against Buffalo since he was traded to the Flyers a year ago. ''We know we can play a lot better,'' Biron said. The injury-depleted Flyers were without star center Daniel Briere, who missed his first game this season due to a sprained right shoulder. The Islanders continued their mastery of their big-city archrivals despite their own continuing futility on the power play. Jeff Tambellini’s shootout goal in the sixth round gave the Isles the win after they blew a 3-1 lead and allowed a League-leading 14th shorthanded goal. Wade Dubielewicz, playing for the second straight game because starter Rick DiPietro is away due to a death in his family, was sharp with 27 saves and five stops in the shootout. He rekindled memories of last spring, when he also beat the Rangers in a shootout while sparking a 4-0 final-week run to a playoff berth. Dubielewicz might get another chance at home Thursday when the Islanders host the Rangers. DiPietro is expected to return to practice Wednesday, but coach Ted Nolan indicated he could go with Dubielewicz instead. The Rangers are 7-0-3 in their last 10 games but lost to the Islanders for the fourth time in five games this season. They often appeared frustrated against the diminutive Dubielewicz. Tambellini, the AHL’s leading goal-scorer before his recent recall, ripped a wrist shot past Henrik Lundqvist to give the Isles a much-needed win that moved them within three points of Philadelphia for the final playoff berth in the East. The Rangers came out storming, but the Islanders led 1-0 after one period when Blake Comeau’s pass from the right corner went into the net off defenseman Michal Rozsival at 18:43. Nigel Dawes’ power-play goal at 2:29 of the second period tied the game briefly, but Sean Bergenheim picked the top left corner with a wrist shot at 3:10 and Trent Hunter’s goal two minutes later made it 3-1. That gave the Islanders three goals in a five-shot span — two days after being shut out 1-0 by Florida despite taking 53 shots. Their 18 shots against the Rangers was a season low. The Rangers got one back on Chris Drury’s slap shot past Dubielewicz at 7:14 and tied it at 5:47 of the third period when Ryan Callahan banged home a rebound on a 2-on-1 shorthanded rush. The Isles have allowed three shorthanded goals in their last four games. New Jersey snapped a three-game losing streak and damaged Toronto’s playoff hopes thanks to Martin Brodeur’s 41 saves and two goals by Zach Parise. The win kept the Devils a point behind Pittsburgh in the Atlantic Division race. The loss kept the Leafs six points out of the last playoff berth. “One game at a time is a cliché, but you're not going to go 15-0 down the stretch," Leafs coach Paul Maurice said. "So the rebound Thursday (at Boston) is very important." Brodeur was as good as he’s ever been in his Hall of Fame career, holding off the Leafs until the Devils offense got going, then keeping them at bay after Nik Antropov’s goal late in the second period made it 2-1. "He was the difference," Toronto’s Matt Stajan said. The Leafs outshot the Devils 14-5 in the opening period, but trailed 1-0 after Parise whipped around from behind the net and blasted a shot that beat Toskala on the far side at 11:22 for his team-leading 26th goal. New Jersey made it 2-0 when Gionta slid home a rebound on a power play 5:11 into the second period. Antropov pounded a rebound after a nice rush from Tomas Kaberle, cutting the margin to one with 3:13 left in the middle period. But third-period goals by David Clarkson and Parise gave New Jersey some breathing room. The Leafs continued to press in the third period, outshooting New Jersey 18-11, but couldn't find the equalizer against Brodeur. "Classic New Jersey Devils game, it's 2-1, you open up your game and they pounce on you and capitalize," Maurice said. The win snapped an 0-2-1 slide by the Devils, who had scored just once in their last two games. “We found a way to score, and there were some nice plays on the goals, especially the third and fourth," Devils coach Brent Sutter said. "We played pretty well, outside of a few minutes there in the second period and, obviously, Marty made some big saves at big times, which you need in this league." The Blues snapped a six-game losing streak by beating a team that’s struggling worse than they are. Ryan Johnson’s goal with 6:54 left in regulation ended St. Louis’ 0-5-1 drought and handed the Kings their fifth straight loss and seventh in eight games. Those in the announced crowd of 14,973 who braved a major snowstorm saw Johnson break a 2-2 tie when he tipped Jamal Mayers’ pass down the right wing past a sliding Anze Kopitar and beat goaltender Erik Ersberg between the pads. "It's something we certainly work on in practice,” Johnson said. “Once I knew I was in with a ton of speed, I was almost just trying to slow myself down. Sometimes you get going so fast, it's tough to make a play on net. I just tried to look up, take a step and make a play to the net." The Blues then survived a wild final minute in which the Kings were skating 6-on-3 for a while after pulling Ersberg. They had a couple of good opportunities, but missed the net twice and saw Manny Legace stop a slap shot by Michael Cammalleri. "It was very spirited. You knew it was going to be a tight game," Kings coach Marc Crawford said. "And it was a very tight game. But they got the breaks from the officials tonight on the calls, and that ended up being the difference in the game. We had that power play right at the very end of the game. I thought that our guys battled hard tonight, and they had six good chances in the third period. Unfortunately, we couldn't solve their goalie in the third period." Andy McDonald gave the Blues a quick lead, banging in Paul Kariya’s pass 1:40 into the game. Alexander Frolov tied it at 19:12 when he picked up a loose puck in the slot and wristed it past Manny Legace. Dustin Brown gave the Kings their first lead when he beat Legace from the left circle at 4:02, but Keith Tkachuk made it 2-2 at 11:53, beating Ersberg with a wrist shot on a 2-on-1 break. The three goals were a rare offensive outburst for the Blues, who play in Detroit on Wednesday to begin a nine-game, three-week trip. "We limit a team to two goals and we've done that in 11 of the last 13 games," coach Andy Murray said. "It's amazing that our win totals have not been better than that, but tonight, we managed to score three goals." Chicago won at the Xcel Energy Center for the first time in nearly six years and kept its playoff hopes alive behind the goaltending of Patrick Lalime, who stopped 28 shots and continually frustrated the Wild. “Their goalie stood up for those guys and played great," Wild forward Pavol Demitra said. "He stole easily like five goals from us, especially the first 20 minutes." Justin Williams, Dustin Byfuglien, Duncan Keith and Craig Adams scored for Chicago, which got its eighth win in 11 games and first in Minnesota since March 29, 2002, and stayed within six points of the last playoff berth in the West. "Every game is big for us now," Lalime said. "This time of year, we're very fortunate that we've put together a little streak here." The loss left Minnesota and Calgary even atop the Northwest Division with 79 points, though the Wild have two more victories. Demitra put Minnesota ahead at 5:56, firing Marian Gaborik’s pass behind Lalime. But Williams tied it 45 seconds later when his centering pass hit Minnesota center Eric Belanger and went into the Wild net. Keith put Chicago ahead at 7:40 of the second period. A replay review allowed his goal after it was initially waved off because of a high stick. "They got two lucky goals. What are you going to do?" Belanger said. "Move on and play the next game." Byfuglien, a native of Roseau, Minn., took a pass from Williams and made it 3-1 on a power play early in the third. "It's the kids, you know, they won it," coach Denis Savard said. "They're working together, skating together. I like what we are seeing." Veilleux cut it to 3-2 with 13:13 left, but Minnesota was unable to tie it before Adams hit the empty net with 15.2 seconds remaining. Nashville made short work of Edmonton’s seven-game home winning streak, beating the Oilers for the eighth straight time as Martin Erat scored a natural hat trick, his first three-goal game in the NHL. The victory moved the Predators past Vancouver and into eighth place in the Western Conference playoff race. They are 2-1-0 halfway through a six-game road trip. Nashville never let the Oilers or the sellout crowd at Rexall Place get into the game. J.P. Dumont scored 55 seconds into the game and Erat scored at 3:48 and 13:09 for a quick 3-0 lead. "We have had a lot of success against Edmonton, I don't know what the cause of it is," Predators goalie Dan Ellis said. "I think it just comes down to really executing when we do play them." The Oilers changed goaltenders after one period, replacing Mathieu Garon with Dwayne Roloson, but it didn’t help. Erat swatted Shea Weber’s rebound past Roloson 54 seconds into the second period for a 4-0 lead. "To watch a guy like that get a hat trick is something special," he said. "He's a special player and we rely on him for a lot of our offence. And he really contributed tonight." Edmonton defenseman Tom Gilbert spoiled Ellis’ shutout bid at 5:46, but Ville Koistinen restored Nashville’s four-goal lead at 9:33, beating Roloson with a rising wrist shot. The Oilers had won four in a row, and the seven-game home winning streak was one short of the franchise record. “In this homestand we've had a lot worse first periods and a lot better results," Oilers coach Craig MacTavish said. "We got caught on the first goal, and then it looked like there was a funnel in front of our net and anything put on it was going to get funnelled in. "We were guilty of being careless at times with the puck and it seemed like every time they entered our zone they were digging it out of our net." Miikka Kiprusoff has been criticized at times this season. But the sellout crowd at Pengrowth Saddledome could find nothing to complain about in his play against Columbus after he stopped 39 shots to pull the Flames even with Minnesota atop the Northwest Division with 79 points. Craig Conroy got the only goal of the game 5:49 into the third period. Kiprusoff did the rest. “He was our best player tonight," Calgary coach Mike Keenan said, "Everybody in the building knows that. Certainly he made the difference for us. He kept us in the game when they were really pushing early, and then he was just stellar throughout the game from start to finish." Kiprusoff was returning to the net for Calgary after getting an unusually long five-period rest on the Flames two-game road trip. He was yanked after the first period at Anaheim on Friday and watched Curtis Joseph win Saturday night in Phoenix. Kiprusoff said the break gave him a chance to get in a couple of good practice sessions. "If you get a night off, you're able to have a couple real hard practices," said Kiprusoff, who recorded career shutout No. 26. "When you play a lot, you have to be smarter and get some rest." The rest must have done him good. He stopped all 18 shots he faced in the first period, when Columbus outshot the Flames 18-6, and foiled Columbus’ top scorer, Rick Nash, on a second-period breakaway. "He made big saves, and he doesn't give up a lot of rebounds,” Columbus center Michael Peca said. "We dominated at times, but to come up short is frustrating. It's one of those games that you fear, because the (longer it remains scoreless), the more experienced teams like Calgary find a way to get a goal." The Flames went ahead whenEric Nystrom's shoot-in attempt glanced off the stick of Blue Jackets defenseman Aaron Rome. Conroy grabbed the puck as he raced into the Columbus zone, cut to the net and put a backhander over the blocker of goalie Pascal Leclaire. "It was a lucky shot,” Conroy said. “I wanted to shoot it higher. I don't score many, but it feels good." The loss dropped Columbus six points behind the last playoff spot in the West. The Blue Jackets went 0-for-6 on the power play and are 0-for-27 in their last eight games. "Our power play was not good enough tonight, especially on the 5-on-3," Nash said. "We didn't even get one really great scoring chance, and that's unacceptable."